Scratch built in wood, Walthers cast metal journals. Full iterior and underbody details. Weathering was done with chalks and Floquil weathering color oversprays. 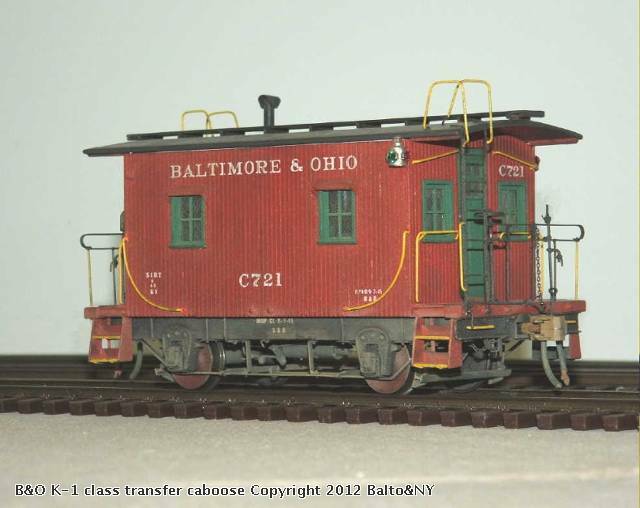 B&O K-1 cabooses were in service form 1889 to 1952, mainly on sub-divisons and subsidiaries after 1930. 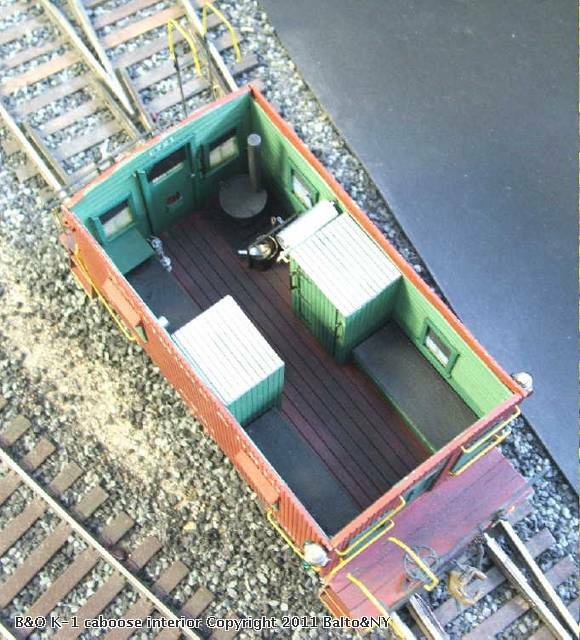 Interior details of the B&O 4 wheel caboose. It contains a stove with coal scuttle, ash pot and scoops, sink with water tank above. Two lanterns (one red, one clear) fusee racks on both doors. Leather covered bench/bunks, conductor's fold-up desk and storage lockers. Not seen on the left side wall, the conductor's air brake gauge and valve and coat hooks. Cupolas were removed from most of these cabooses by the 1940's. Not in mainline service since WW I, these little cabooses worked on small branch lines as well as in terminal and transfer service. Couplas (for observation of the train when underway) were no longer needed.